Since ancient times, people have wondered how to communicate over long distances. The term "telecommunications" refers to the transmission and remote reception of signals carrying all types of information, from simple text to images and sound. Unlike messengers or the postal service, telecommunications signals carry messages that have no physical substance. Today, cables and radio waves carry all manner of information around the planet via the many networks that are constantly expanding and combining in infinite ways. Before the advent of modern communications, however, our ancestors had to use their ingenuity to send messages. The human voice, light signals and smoke signals were the forebears of modern telegraphs, telephones, radio, television, faxes and the Internet, which are the result of rapid advances made possible by the advent of electricity and, more recently, computers. Founded in 1865, the ITU, which has around 195 member states, promotes international cooperation in telecommunications. Its activities include providing technical assistance for developing countries, regulating the industry, implementing standards and allocating radio frequencies. In France, the Autorité de Régulation des Télécommunications (ART) manages French telecommunications legislation and competition. Since time immemorial, people have needed to communicate over long distances. Early attempts at long-distance communications include torches and light beacons in Ancient Greece, drums and bugles on battlefields, tom-toms in the savannah, smoke signals used by Native Americans, horns at fortified castles and yodelling in the Alps. However, light and sound signals can only carry a few miles. The first real communications network appeared at the end of the French Revolution. 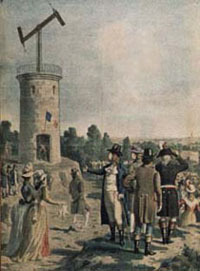 The visual telegraph, developed by Claude Chappe, linked Paris and Lille by a series of towers along which coded messages were sent using semaphore. Half a century later, it was superseded by the electric telegraph. This transmitted signals using metal wires, meaning it could also be used at night and in adverse atmospheric conditions. The system was later improved by the introduction of Morse code. The electric telegraph also prompted early research into the transmission of still images. Line-by-line analysis and transmission of photographs was extended to moving pictures, culminating in television, which appeared around 1920. Underwater cables made it possible to progressively establish links between continents. The telephone also appeared around this time. Based on the concept of electromagnetism, it converts the sound vibrations of the human voice into electrical signals using a magnetic field. In France, telegraphs and trains ran side by side, as the country's telegraph network was set up in partnership with the rail companies. The telegraph lines ran alongside the railway tracks, so they could be monitored at all times. Railway workers also used them to send messages between stations. Opening of France's first operational electric telegraph line, between Paris and Lille. The electric telegraph and the telephone gave a major boost to the development of telecommunications. However, the use of cables to connect transmitters and receivers soon began to show its limitations. By the late 19th century, research was being conducted into electromagnetic waves. The laws of electromagnetic wave propagation showed that information could be transmitted without cables. The advent of wireless telegraphy and telephony offered enormous potential, despite the poor quality of the first transmissions. Its many applications include the arrival of radiotelephony and the first cordless telephones, as well as radio equipment for maritime safety and military communications. The relief of the Earth's surface and the huge distances involved (see picture) still posed a problem, though. Due to the number of relay stations required, the system soon proved expensive. It also had limited application for intercontinental links. Electromagnetic waves travel in straight lines. The Earth, however, is round. This means that signals transmitted over long distances cannot reach the receiver, as the curve of the Earth's surface and other obstacles get in the way. To overcome this problem, relay stations are used. Satellites make an ideal relay, and are also cheaper. Following the launch of the first Sputnik satellite in 1957, the idea of using satellites orbiting the Earth as radio relays emerged as a natural solution to the problem. Thus began a revolution in telecommunications. The potential offered by satellites far exceeded anything offered by ground-based systems, and the last geographic limits were finally overcome. Since then, numerous satellite-based telecommunications networks have been developed to meet growing demand in a wide range of specialist areas. Although telecommunications technologies have come a long way since the early years, messages are still carried in the same way, using cables and electromagnetic waves. Copper wire, fibre-optic cable and radio waves form complementary networks. Satellites are also used to relay messages between thousands of ground stations worldwide. The first telecommunications satellites were passive satellites, designed simply to reflect signals from one ground station to another. These were superseded by active satellites, which receive radio signals, amplify them by a factor of several billion and then re-transmit them to the ground. 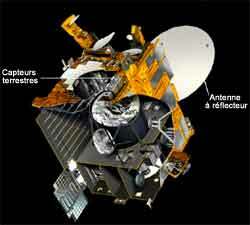 The first satellite links between France and the United States were established via an active satellite in 1965. The first experimental satellite, the precursor of modern telecommunications satellites, was launched on 12 August 1960. The American Echo 1 satellite was a huge aluminium-coated balloon, 30 metres in diameter, which was inflated in orbit. It was a passive satellite, designed simply to reflect radio waves received from ground stations. The reflected signal was very weak. The first satellites were non-synchronous satellites in low-Earth orbit. They were easy to orbit and close enough to Earth to act as passive radio relays. However, because non-synchronous satellites move with respect to the Earth, they can only establish communications for a few minutes during each pass. Geostationary orbits. These are circular orbits in which the position of the satellite is fixed with respect to Earth. This is the cheapest and most effective solution. A satellite orbiting at an altitude of 35,786 kilometres above the equator has a period of revolution around the Earth the same as the Earth's period of rotation, so it’s ground track is a point on the equator. 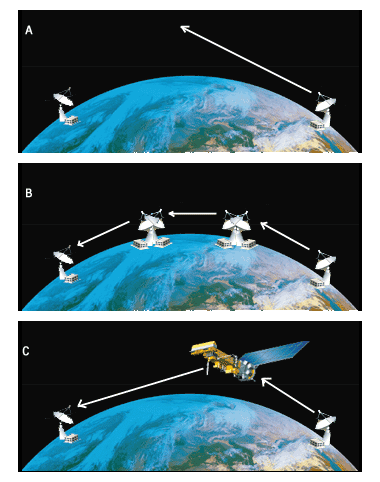 Three geostationary satellites, correctly positioned, can cover the entire surface of the globe between the latitudes of +80° and –80°. The Clarke Belt, which contains all telecommunications satellites in geostationary orbit. Since 1957, telecommunications satellites have been placed in geostationary orbit. Despite its circumference of 264,000 kilometres, the Clarke Belt must be regularly cleared of spent satellites to avoid congestion and interference. Most telecommunications satellites currently in orbit are geostationary. Constellations of non-synchronous satellites are essential for specific applications such as the Global Positioning System (GPS), which requires coverage of all points on the surface of the globe by several satellites at the same time. Telecommunications satellites rely on the properties of propagating electromagnetic waves to convey information, which is transmitted using carrier waves in clearly defined frequency bands. A satellite may be a passive element of this transmission process, acting simply as a relay that amplifies signals and transposes frequencies. It may also be a switching node or signal adapter, in which case it plays a more active role. This function is performed by a device on the satellite called a transponder. 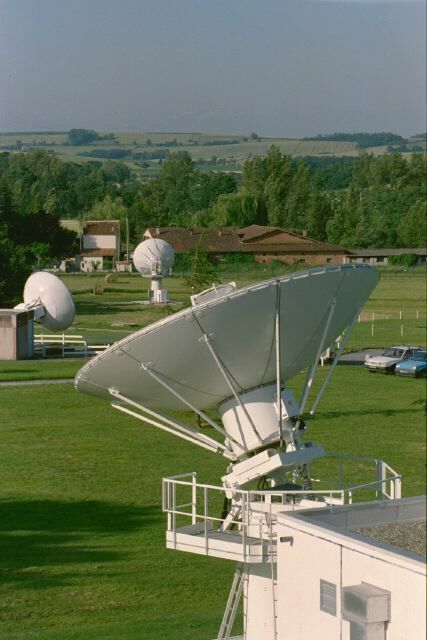 Ground-station antennas are used to both transmit and receive signals. At an altitude of 36,000 km, a satellite is little more than a tiny speck in the sky. The antenna consists of a feed, pointed very precisely at the satellite, and a parabolic reflector. The satellite is also fitted with antennas. To limit signal loss, the energy received is focused into narrow beams using reflectors, which can be several metres across. The slightest change in the line of sight of the ground or satellite antennas can result in deterioration or loss of the signal. To maintain maximum precision, satellites are fitted with stabilizing and pointing systems to counter external disturbances and stay almost permanently in contact with the ground. .